The team at WhiteClouds went to work. Each designer took a component of the Hyperloop concept and designed digital 3D models based on images released by Musk. The physical model consists of elevated tubes supported by pillars. Passenger transport capsules run through the tubes, and a station is nearby where people will load and unload. After the models were designed in various computer aided design (CAD) software, the group used three different 3D printers to print the parts layer by layer. The Connex 500 printed the pillars in an ABS-like plastic. The tubes are made of a clear UV-cured resin and printed with the ProJet 3500 HDMax. The ZPrinter 650 printed the station platform and the pods. They are full-color and made of the sandstone-like material. The team then assembled the parts to create the scale model of the Hyperloop. “Seeing the Hyperloop in person really gives you an idea of what [Musk] is presenting,” Davis said. The WhiteClouds’ Lab is home to 10 types of 3D printers that use different technologies and materials to build 3D objects. The Hyperloop project is a fun first demonstration of what WhiteClouds is able to do, but the company is busy working on other 3D printing-related projects that will help bring 3D printing to the masses, company officials say. Ropelato and his team believe 3D printers will play a big role in our lives in the future. “This technology minimizes the time it takes to create a working object. 3D printing opens the doors to create something original to everyone,” said Ropelato. While the Hyperloop will take some time and advances in technology to come to fruition, 3D printing has already left the pages of science fiction and is impacting the way we conceptualize and build objects. 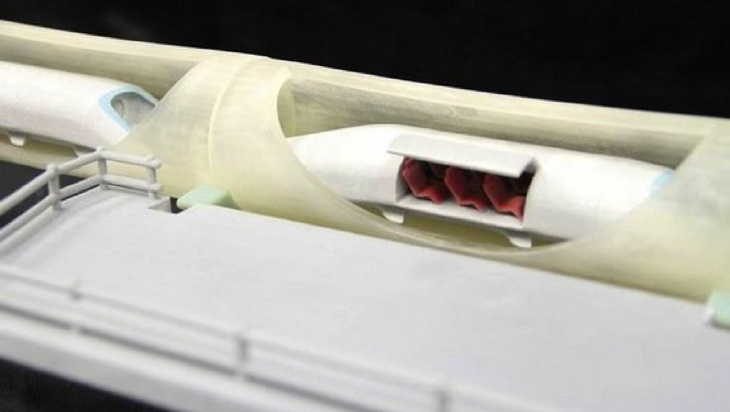 Maybe by time the Hyperloop transit system is ready to be built, it will be 3D printed.